On first viewing Helga Groves’ ‘Flood’, two questions announce themselves: the first concerns the work’s status as an art object (is it a painting or is it a sculpture? ); the second is the question of abstraction (is it literal in its presence or non-representational?). ‘Flood’ stands proud of the wall like a sculptural relief, yet adopts the format and concern with surface of a conventional painting. However, unlike a conventional painting, the ‘canvas’ weave is near transparent – a woven mesh of nylon fishing line, the weave open enough to permit visibility into the recess created by the stretchers – thus exposing the anatomical dialogue between support and frame. Groves’ X-ray view plays out the painting format, conscious of the dilemma between object and illusion, the interaction between form and facture, to deconstruct the artifice of painting. In 20th-century art, the grid is a standard for non-objective subject matter but Groves’ grid of woven synthetic is more than modernist artefact: it is both a substitute for the customary textile support for pigments, the bearer of colour itself and an actual grid, formed of fishing line. Groves often works from scientific sources though this is not necessarily evident in this work. There is the suggestion of religious references in the triptych format and the biblical deluge of the title. In fact the title refers to the flooding Groves witnessed during her time as artist-in-residence in Bundaberg in northern Queensland. 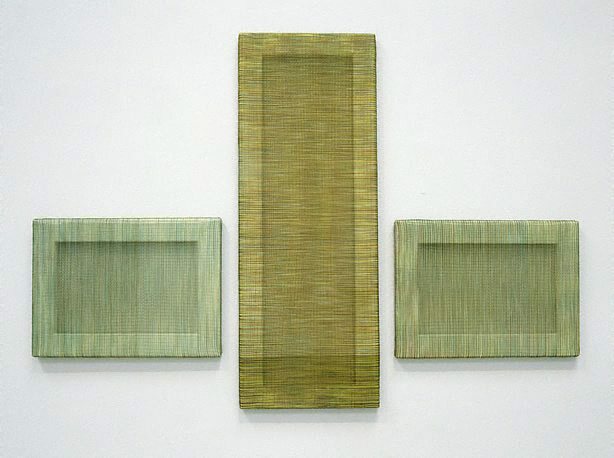 Many of Groves’ titles refer to water, often with quite specific locations: 'Burnett River' 1999, 'Deep River' 2000 and 'The Yarra River' 2000, for example, were shown with ‘Flood’ at Sydney’s Gitte Weise Gallery in 2000.1 The horizontal and vertical elements conjure up height and horizon, tidal indicators, water levels and the stratification of sediments. The pelagic vocabulary is extended by the use of shiny transparent fishing line with its variegated cool green and brown palette and the repetition and notion of pattern. ‘I am interested in using translucent materials, and materials and mediums which are altered by the effects of light’, noted Groves in a statement made in the mid 90s.2 Referring specifically to technical matters, she seems almost to be oblivious to aesthetic effect. But ‘Flood’ transcends technique with a surprisingly natural beauty, its light-catching, sheer fabric creating a delicate shimmer that trembles across the surface of green watery depths. Signed and dated verso each panel, pencil "...1999 Helga Groves". Michael Desmond, Contemporary: Art Gallery of New South Wales Contemporary Collection , 'Abstraction', pg.16-59, Sydney, 2006, 32, 33 (colour illus.). Ingrid Periz, Helga Groves , 'Evaporate', pg.3-5, Victoria, 2000, 5, 8 (colour illus. ).